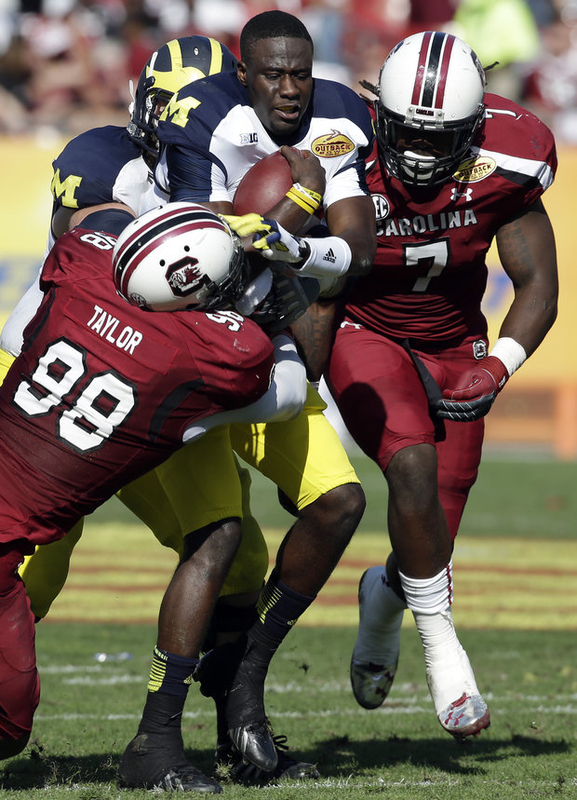 Michigan and South Carolina played in the Outback Bowl - one of 35 bowl games. Outback Bowl was one of 35 bowl games. Most people - like me - have had the view that there are way too many college football bowl games. There are 35 in all starting on Dec. 15 and finishing on Monday with the Championship game in Miami between Notre Dame and Alabama. I was used to only four games on New Year&apos;s Day: Rose Bowl, Sugar Bowl, Cotton Bowl and Orange Bowl. You spent only a day planted in front of a television and when the final second ticked off the game clock that was it. Over until next year. My personal experience for a bowl game was zero. Having gone to a college without an athletic program there was never a vested interest in "my" team. However, there were many programs that caught my interest and were enjoyable to watch, but still no personal interest. Face it - the football programs nearest to Chicago have not set the world on fire until recently (except Notre Dame). That is a major reason why the Irish have such a huge connection to Chicago. This year it was different for me and not because of a team, but because of an opportunity that my son Jaxon&apos;s high school, Fremd of Palatine, gave to their marching band program. This is where my personal experience changed my thoughts on bowl games. A year ago, the band students voted on going to Florida to play at Disney and the halftime of the Outback Bowl on New Year&apos;s Day. Over a hundred-twenty students and chaperones with their band director Matthew Moore took the six-day excursion. They marched down Main Street at Magic Kingdom, worked with a Disney musical director at Epcot and traveled on to Tampa to be part of the Outback Bowl. This is where my eyes were open to the college bowl happenings and the atmosphere surrounding the game. For a city like Tampa, this is an important endeavor and a boost for their economy. The city rolls out the red carpet for the fans, (in this case Michigan and South Carolina). It is also extended to the students and families, like ours, that had traveled a distance to be a part of this event. The Outback Bowl had three major events for the students to perform, a competitive music festival (they did great), the Outback Bowl Parade on Dec. 31 with a trip to Busch Gardens to celebrate the New Year, and then the big event: being part of eighteen bands with over 2,200 musicians playing as part of the halftime show at Raymond James Field home of the Tampa Bay Bucs. They had two long practices to prepare for the halftime show with all 2,200 kids. The day of the game, it was entertaining to sample the crowd and the media gathered for the game. The Michigan fans were dressed in their maize and blue and the South Carolina in their burgundy and gray. Old and young alumni filled the stadium and partied in the parking lots. All the souvenirs stands had lines and the food and drink flowed like any game. It hit me that this was more than a game for most of the fans: it was an extension of something they hold near and dear to them. It was flat out fun. The game was actually the best of the college bowl games for the day. Michigan had nice solid drives and South Carolina had big plays and finished the game with a last second touchdown for the win. The halftime show was the culmination of a year of planning and practicing for the students that participated. They followed the Michigan and South Carolina bands. And from the stands, a mom could see her son play the saxophone and realize there is much more to a bowl game. They can have a hundred bowl games, it is all right by me.